Herbed Grilled Chicken Paillards | eat. cook. blog. Herbed Grilled Chicken Paillards. “Qu’est-ce que c’est un paillard?” you ask. Paillard (pronounced pie-yard) is the French term for a boneless chicken breast or other cut of meat that’s been pounded into broad, thin sheets about 1/4″ thick. I think we’ve had these with just about every salad on the blog. Just the other night it was the Kale & Brussels Sprouts Salad. Grill a few extra paillards and you’ll have chicken for Fiesta Chicken Salad. Lightly wet a chicken breast with cold water and set it between two sheets of plastic wrap. Pound it into a broad, flat sheet about 1/4-inch thick (called a paillard), using a meat pounder, the side of a heavy cleaver, a rolling pin, or a skillet. 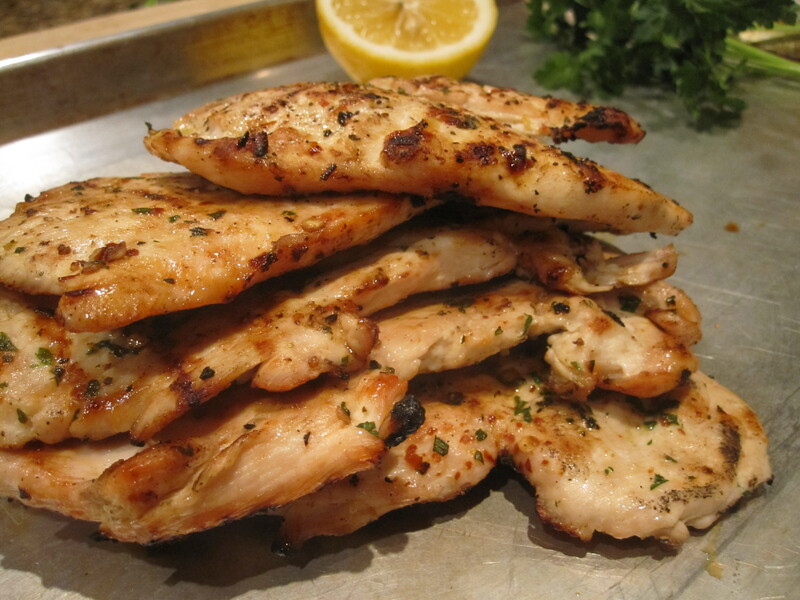 Pound the other breasts into paillards the same way and arrange them on a baking sheet. Generously season each paillard on both sides with salt and pepper and a pinch or two of chile flakes. Sprinkle both sides with the garlic and rosemary. Drizzle both sides with the lemon juice and olive oil and pat into the meat with your fingertips. Refrigerate the paillards for 20 minutes while you prepare the grill.